Jalan Bukit Bintang is known for its glitzy malls and bars, which tourists make a beeline for. However, among the bustling nightspots and shopping centres, there are at least six agarwood shops and perfumeries along that street alone, attracting the stream of Arab visitors looking for the expensive scent used to, among others, spray on the curtains that cover the Kaabah in Mecca and for incense burnt in their homes. Preparing for the coming “Arab season” in August, these thriving shops have boxes and boxes of the rare wood in stock, mostly sourced from Malaysian rainforests. Shopkeepers said they buy their stocks from local middlemen, some of whom approach them right in their shops. Malaysia’s poorly enforced agarwood export and harvesting permit system is allowing the black market trade to bloom, said agarwood trade expert Lim Teck Wyn. He said the Malaysian Timber Industry Board was responsible for issuing CITES (Convention on International Trade in Endan­gered Species of Wild Fauna and Flora) export permits for agarwood, which required traders to show a harvesting permit – also known as a removal pass – before approval is given. The pass is to prove that the traders have legally sourced the agarwood. “But the permit system is not working because there is no real enforcement,” Lim said. 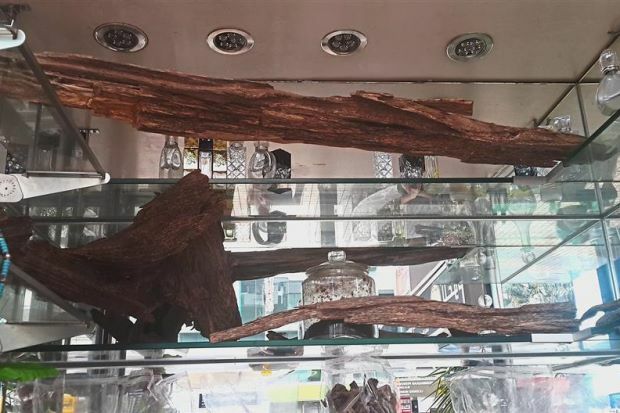 He said merchants were openly selling agarwood in Bukit Bintang with no restrictions. “The Forestry Department is not issuing removal passes and neither the orang asli nor poachers are bothered to apply because the buyer doesn’t need it,” he claimed. Middlemen continue to rely on illegal foreigners to collect agarwood for international and domestic sale. It was also easy to export the products without a permit because loopholes allowed agarwood to be “falsely declared” as wood chips, he said, adding that this allowed traders to bypass the export permit system. Because the board’s permits – which require a removal pass – are only for exports, those selling agarwood locally face no enforcement that requires them to prove that the agarwood is legally sourced, Lim added. Lim, who is behind the 2010 CITES Secretariat-commissioned report “A Wood for the Trees: A Review of the Agarwood Trade in Malaysia”, recommends that the Federal Govern­ment work with the Forestry Department of Peninsular Malaysia (FDPM), the Customs Department and Kuala Lumpur City Hall to crack down on those selling such products along Jalan Bukit Bintang. “It is also important for the Forestry Department to start issuing agarwood permits to create a supply of legal agarwood and allow the whole supply chain to be legalised. “The moment you have one legitimate dealer, there will be pressure on the others to clean up their act,” he said, adding that some dealers were forced to purchase illegal agarwood as there were no legal sources available. In his report, Lim, who is also a forest researcher, also called for regulation of the agarwood trade by setting up a national registrar of industry participants and an inventory of commercial enterprises. “These recommendations are pertinent more than ever now owing to the status of the critically-endangered Aquilaria rostrata,” he said. Aquilaria rostrata is another karas tree species which also produces agarwood. “The gaharu issue is actually much bigger and deeper than just the plant going extinct. Lim said the orang asli had been harvesting the agarwood sustainably for hundreds of years while poachers were notorious for indiscriminate logging of the karas trees.